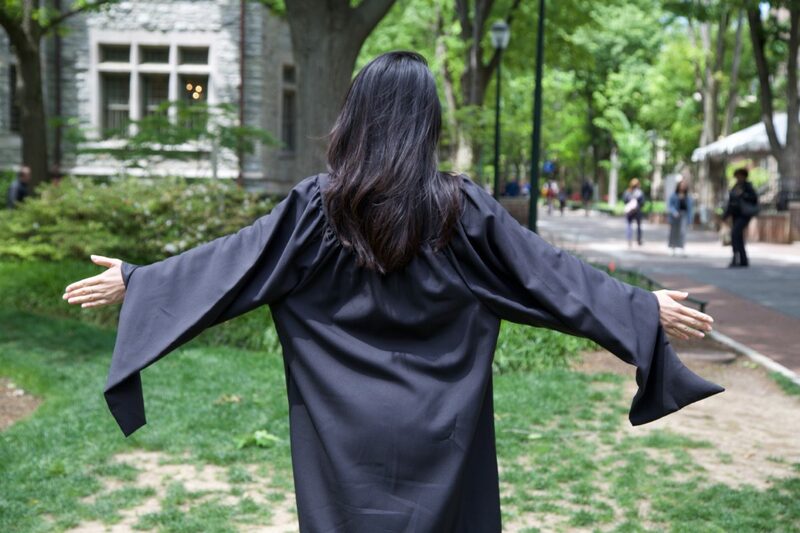 Amidst a sea of black robes at Commencement, you may look around at your classmates and think the cap and gown looks pretty uniform. In actuality, this traditional regalia actually has a lot of little intricacies that reveal specific details about your degree. Here’s a dressing down on everything you need to know about the classic Graduation getup. Pointed, meant to be worn closed. Oblong, can be worn open or closed. Bell-shaped with three velvet bands, can be worn open or closed. Historically, hoods were worn over the head to keep warm, but they remained as an important decorative piece of the academic costume. The lining of the hood represents your school colors. 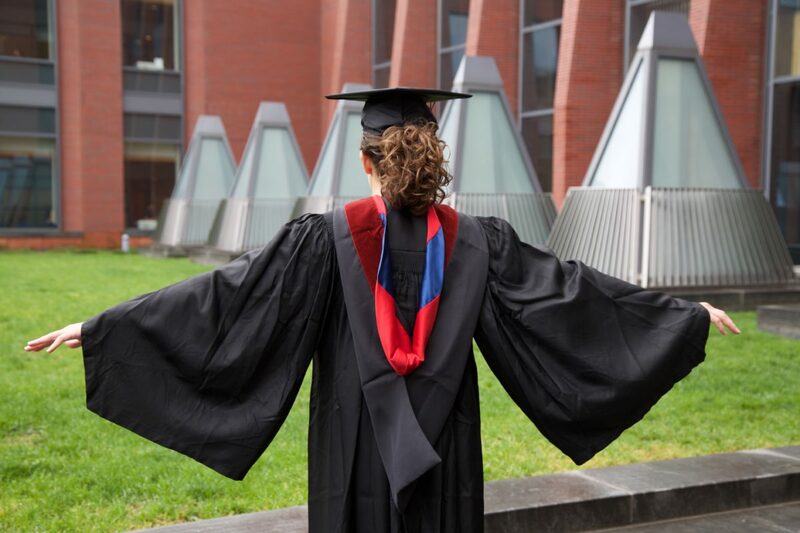 So all Penn graduates wear hoods lined with crimson and decorated with a blue chevron. The velvet band on the edge of the hood is where you’ll see some variation. Its length depends on your degree: a bachelor’s is 2 inches; a master’s is 3 inches, and the doctoral is 5 inches. And the color indicates your field of study. At Wharton Graduation, you’ll see plenty of drab — the dull, light brown color that signifies a business degree. 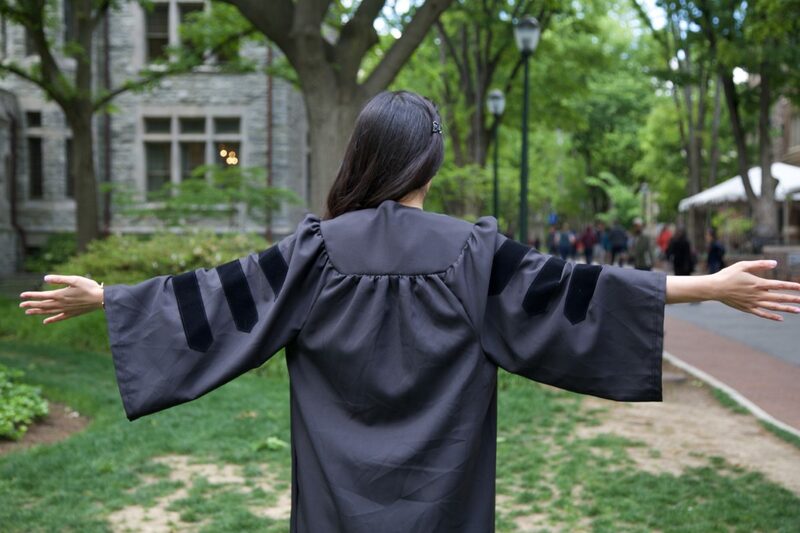 However, since 15 percent of this year’s Wharton grads are dual-degree holders, you’ll likely catch a glimpse of some brighter colors like green (medical), purple (law), and light blue (education). These specifics aren’t picked at random or unique to Penn, they’ve all been spelled out in the American Academic Costume Code estab­lished in 1895 by a commission of delegates from the Ivy League and New York universities to standardize academic regalia in the U.S. In Europe, there is no central body to regulate university colors, so the styles of regalia vary from school to school. The cap completes your outfit. Most Wharton grads choose a traditional black mortarboard cap, but a soft, square-topped cap is also available. Over the years, it’s become popular to make this plain black canvas your own by adding words and decorations. Black tassels are uniform for most students, except for doctoral grads who may opt for a gold tassel and a velvet cap. 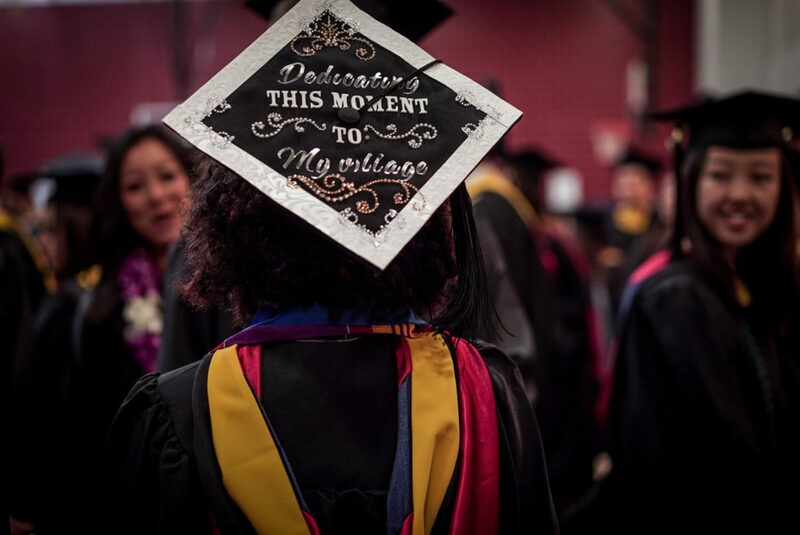 You’ll start with the tassel on your right, then once you’ve received your degree, you’ll turn it to the left — representing your official change in status from a student to an alumnus. Sources: Explaining the History of Graduation Regalia and History of Academic Regalia. Without the cap and gown, graduation just wouldn’t be the same. The traditional regalia has become integral to this rite of passage, but its origins and meaning aren’t as well known. 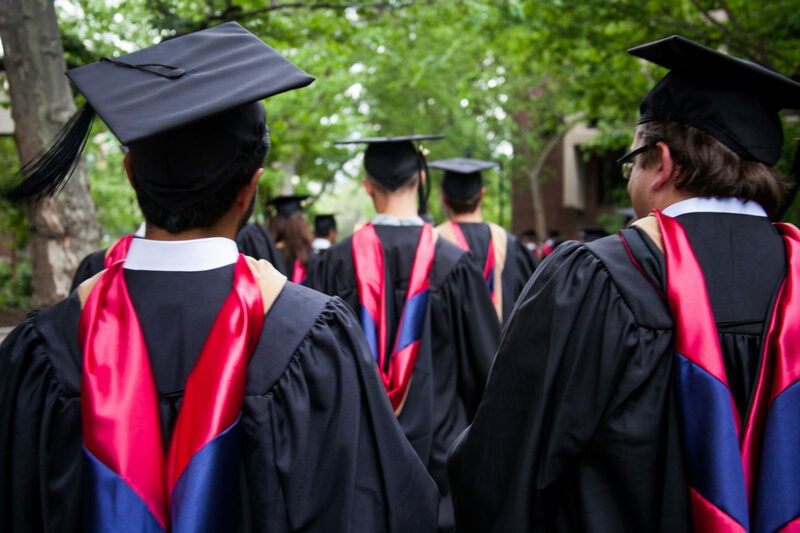 While academic dress was originally inspired by medieval universities, the first recognized schools to officiate graduation attire were Oxford and Cambridge. In the 18th century, American universities adopted their regalia from England’s academic commencement rituals, but no one knows exactly where this peculiar costume got its start. Some historians speculate that medieval scholars wore gowns to keep warm in the monasteries and libraries that housed most early academic pursuits. They believe the significance of the hood dates back to Celtic groups — in which only Druid priests earned the distinction of wearing a hood on their capes to symbolize their higher intelligence and superiority.